Heat the oven to 400 c.
Mix all the ingredients by hand or a mixer, making sure not to cream the butter. This is perhaps the only tricky part of this recipe. It is best to keep the butter as cold as possible during this step and not let it get to room temperature. I prefer to mix by hand, gently breaking up the chunks of butter, and gently tossing the mixture together. 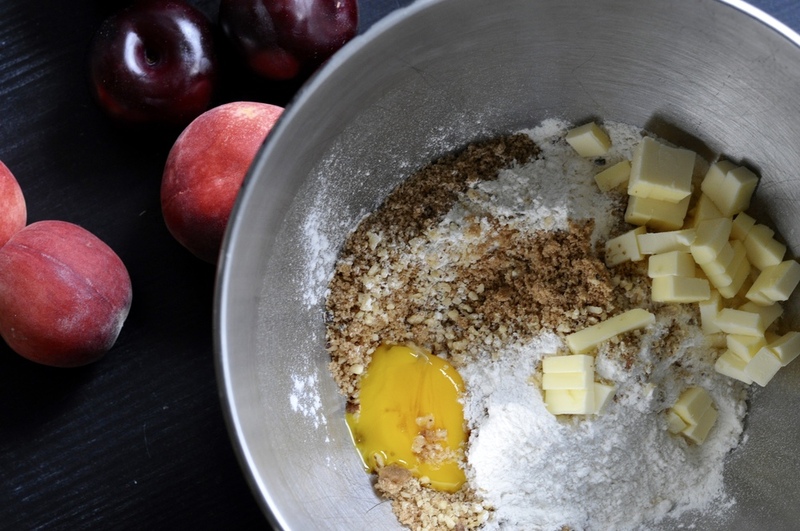 The mixture should be "crumbly", not uniform. Press 1 1/2 cups of the crumble mixture onto a 9-inch pie dish or a springform pan in an even layer, pushing the mixture up the sides of the pan. I use a flat-bottom glass for this step. Arrange the sliced fruit in a circular pattern, skin side down. Sprinkle the remainder of the mixture over the fruit. Bake 40-50 minutes, or until the juices start bubbling up and the tart starts looking deep golden brown. Enjoy with a scoop of vanilla ice cream!